This sermon, offered on Christmas Day 2017 by the Very Rev. Andy Jones at Saint Andrew’s Episcopal Church in Madison, Wisconsin is a slightly updated version of a sermon offered on Christmas day 2015. It is build around the readings assigned for Christmas III in the Revised Common Lectionary. You can find those readings here. What a difference a few hours can make. It’s hard to believe that we are in the same place. Just last night we were gathered here in a dimly lit stable, resonating with the sound of donkeys, sheep, heavily breathing cows, and softly wuffling creatures. The air was sweet with the smell of hay and of straw. This morning, in the bright light of day, we leave the stable, the animals, the familiar and comforting smells, even Mary, Joseph, and the baby far behind. “the earth was a formless void and darkness covered the face of the deep, while a wind from God swept over the face of the waters” (Genesis 1:2). This is John’s version of the infancy narrative. No stable. No manger. No shepherds, sheep, angel choirs… Not even a travel weary couple and their newly born child. Think about it. This isn’t the first time this has happened to us this season. We came here on the first Sunday of Advent, a time of anticipation and preparation for the coming of Christ, and the crèche was empty. Instead of hearing about the child that was to be born in a manger we heard about the Christ who will come again. Instead of hearing about events of 2,000 years ago we heard about… the end of all time. Today, on Christmas Day, we come here again, the crèche is full, the baby is lying right there in the manger, and instead of hearing about the child who is “good news of great joy to all the people…” we hear about… the beginning of all time and all things! The story that we know and love so well; a story remembered in painting, song, and made for TV specials is so familiar, so sweet, so gentle… so domesticated that, on this day when we gather to mark the birth of Christ, we are in danger of forgetting the rest of the story… the part of the story that had the shepherds trembling in fear. “In the beginning was the Word, and the Word was with God, and the Word was God. He was in the beginning with God. All things came into being through him, and without him not one thing came into being. And five more times, eight times in all, the word of God was spoken… and through him all things came into being. We need to remember that what we are talking about, what we are celebrating; the moment that leads us to sing “Glory to God in the highest,” is too big, too expansive, too much… to fit into a story, the elements of which are comforting, recognizable, and familiar. We are talking about the beginning and end, the alpha and the omega, the very breath of God forming the Word, bringing order to the chaos, and giving life and light to all people! But that’s the real beauty of the story that we tell. It is a simple story, one that brings us great joy and comfort, filled with things that we know and understand and at the same time… all of that enormity, the breadth and scope of all time, from the beginning to the end of all things, rushes together, as if it is swirling through a funnel, and ends up right here, in a stable, in a manger, enfleshed, one of us. Last night was a time for tenderness, for love; a time to press our cheek to the soft, downy head of a newborn and breath deep the sweet smell of new life, a life that comes to us with a story that will change the world. “the Word has become flesh and lived among us, and we have seen his glory, the glory as of a father’s only son, full of grace and truth” (John 1:14). 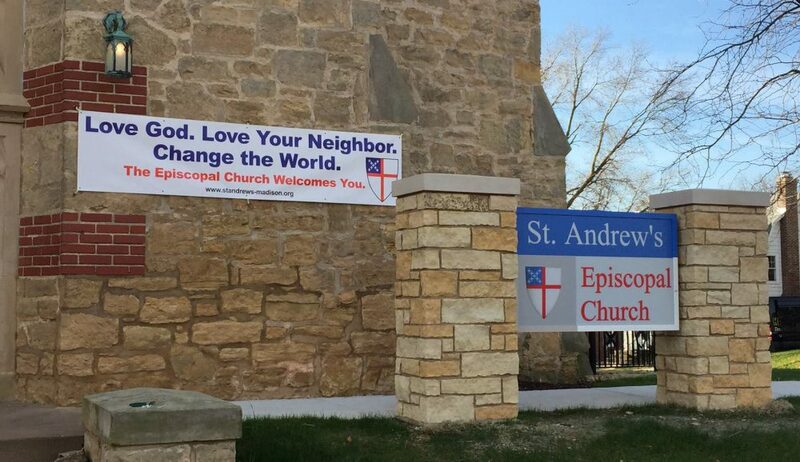 This sermon, offered at Saint Andrew’s Episcopal Church in Madison, Wisconsin, by the Very Rev. Andy Jones, is built around the readings for the 4th Sunday in Advent in Year B of the Revised Common Lectionary. It would be awfully easy to just jump straight into Christmas Eve. After all, we know how this story ends. And we’ve been waiting such a long time… Time is so short… There is a baby on the way! But for now, at least for another hour or so, gathered here this morning, it is still Advent, we are still waiting, hoping, wondering… And it’s a good thing too. But Mary knows that she wouldn’t be the only one to name this son. A sharp intake of breath. Does her heart skip a beat? An aching in the core of her being? Mary is engaged to Joseph but they aren’t married. If she becomes pregnant… The scandal will be ruinous for her and her family! In fact, Joseph would be within his rights to have her stoned! And then there is Herod the Great, the Roman Puppet King of Judea, whose tyrannical reign was characterized by the use of murder and terror. Threats to his authority, and to the authority of Rome, Empire, are crushed without mercy. She has to see this future as fraught with danger, for herself, for the child, and for the people who live under the rule of Herod and the iron fist of the Pax Romana. …This moment is charged with a level of political danger and consequence that is unmistakable to anyone who is paying attention and willing to see the narrative being developed through the angel’s overtures…. Mary is being asked to offer herself, her reputation, her safety and that of her family, maybe even the safety of her people, in order to make God manifest in the world; to set in motion a movement, a revolution that the principalities and powers that hold sway over us and this world will do anything in their power to suppress and destroy. The angel has asked, God and all of history are waiting… what will she say? How will she respond to this… and let’s not romanticize this… to this terrible proposition? One question? That’s it? One question?” That’s all she needs? She doesn’t ask for assurances, for guarantees? Maybe she’s stalling for time. In just a few hours we will gather here again and it will be Christmas Eve. There will be a pageant, this space filled with children, children telling the story of a miraculous birth, a birth to the least likely of parents, in the least likely of places; the birth of the one who brings new life to all the earth. And then again, still later, we will gather, in the dim light of the stable… We will glory in the miracle of new birth, in the tenderness of mother and child, in the voices of angels and heavenly hosts, and in the excitement and wonder of shepherds. We will stand and sing Gloria in Excelsis Deo to celebrate Emmanuel, God With Us and we will hold our candles high as we sing Silent Night, Holy Night. But for now… for now it is still Advent. And while there is still time, before we crowd around the manger to ooh and aah at the child wrapped in bands of cloth, we need to hear the testimony of a young woman who will not be silenced. Jesus, Emmanuel, Wonderful counselor, Mighty God, Everlasting Father, Prince of Peace – who will be great, who will be called the Son of the Most High, who will sit upon the throne of his ancestor David. Who will reign over the house of Jacob forever, and of whose kingdom there will be no end. And so now honoring the voice of a young woman who had the courage to speak truth to power, to offer her testimony and utter God’s Word of love to the world, I invite you to open your prayer books to page 91, and stand as we once again proclaim the Song of Mary.